This summer marks the 100th anniversary of America’s National Park Service, which was founded back on August 25, 1916. Perhaps you saw the Ken Burns series, The National Parks: America’s Best Idea last spring or maybe you’re itching for a summer road trip with a side order of history, but if you’re interested in finding out more, there are plenty of sites and apps available to assist you on your journey into the park system. If you don’t know what national parks are in your area, you can look them up on the NPS site or on Find Your Park. If you think national parks are just big expanses of preserved land, like Joshua Tree in California or the Great Smoky Mountains in North Carolina and Tennessee, hit up the site to see all the outdoor spaces and the more urban man-made monuments supervised by the National Park Service. If a major piece of American history happened there, odds are there’s a monument or museum waiting to tell the story. In New York City, for example, there’s the old Ellis Island immigration center and museum next to the Statue of Liberty, the African Burial Ground in lower Manhattan, Castle Clinton in Battery Park, Federal Hall across from the New York Stock Exchange, the brand new Stonewall National Monument in Greenwich Village, the Lower East Side Tenement Museum, Theodore Roosevelt’s Birthplace on East 20th Street, Grant’s Tomb on the Upper West Side of Manhattan, the Hamilton Grange in Harlem, Governor’s Island out in New York harbor, the Gateway National Recreation area in Staten Island, Brooklyn and Queens. Along with parks and public spaces like the National Mall in Washington, DC, places where wars were fought have been designated as national sites too. Battle sites like Gettysburg National Military Park in Pennsylvania and Fort McHenry in Maryland are just two of them. 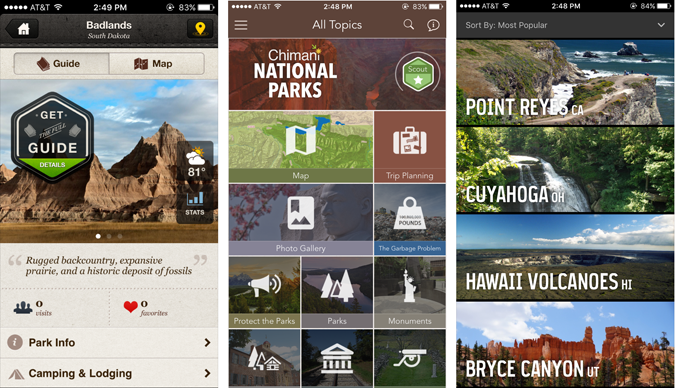 In terms of apps and social media to help you plan a visit, the National Park Service is all over it. The NPS has its own Instagram and Twitter feeds, Facebook page and Flicker gallery. Many parks and national monuments have their own microsites, like the handsome Flickr pages for Yellowstone and the Grand Canyon. 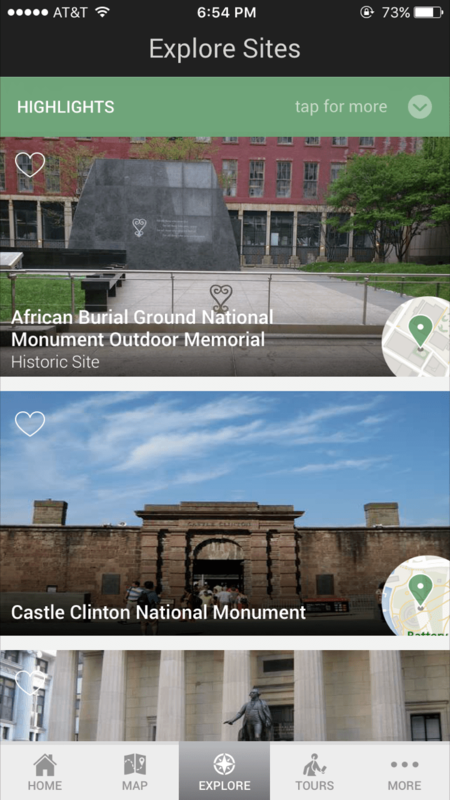 Around here in NYC, there are officially three different mobile apps dedicated to New York’s national areas., including the Manhattan & Governors Island guide shown above. 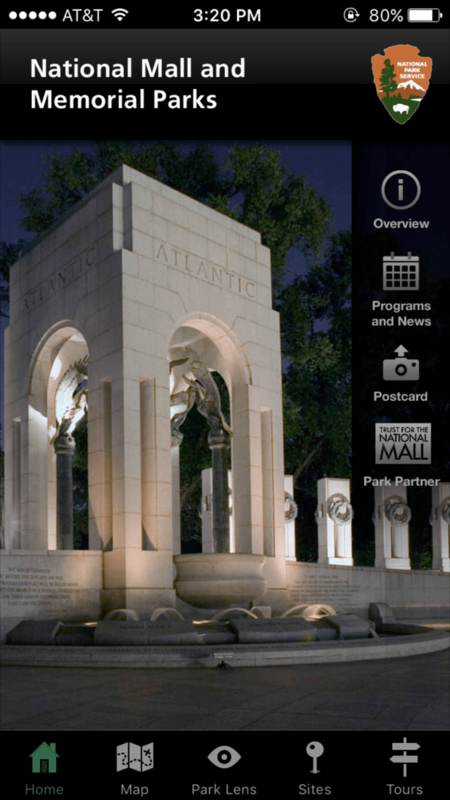 The National Mall has free apps for Android and iOS, as shown farther up the page. If you want to go with a third-party program, National Geographic has an iOS app called National Parks – the app is free, but downloads for individual parks are about $2 each. Chimani has free National Parks guides for Android, Amazon Fire and iOS that do not require a Wi-Fi or cellular signal to use — which is great if you’re visiting some of the more remote, outdoorsy locations in the system and all you have are bears and air. The outdoor gear company REI has a free National Parks app, too, and podcasts for Android and iOS. Blogs and sites created by people who love the national parks also abound online; check out Live Once Live Wild or, 59National Parks, for example. You can also find guides and information on the National Parks Foundation website, which is the official charity of the park service. Many of the country’s national parks need more than government funding to stay open and must charge entrance fees, but to celebrate the centennial, the National Park Service is waiving fees for 16 days this year, including the agency’s birthday weekend of August 25th-28th this summer. And remember, Jellystone is not a national park. Yogi Bear’s old turf is a franchise of RV campgrounds and resorts. Happy Hundred, National Park Service! Money makes the world go ’round, (also the conservation of angular momentum), and things were really spinning this week. That’s because Dell, maker of computers, has agreed to buy EMC, maker of data storage products, for $67 billion dollars. This, of course, is subject to regulatory approval and may take a year to complete, but if it all goes through, it creates the world’s “largest privately-controlled, integrated technology company.” Boo-yah! When one thinks “Pepsi,” technology usually doesn’t come to mind unless it’s something like the limited-edition Pepsi Perfect bottles the company first released at New York Comic Con last week to celebrate the year depicted in Back to the Future II and 30 years since the franchise started. However, the soft-drink company has announced a deal to work with a partner to make Pepsi-branded mobile phones and accessories in China. 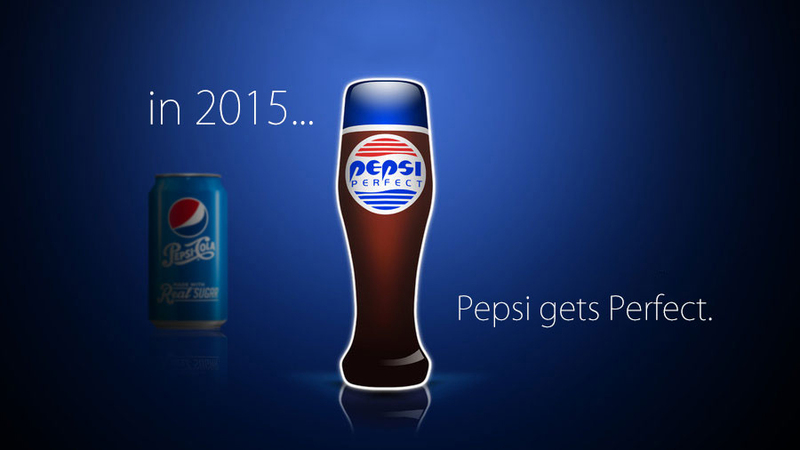 Pepsi’s not doing the hardware, mind you, just putting its name and logo on the Pepsi P1 phone that’s due out soon. 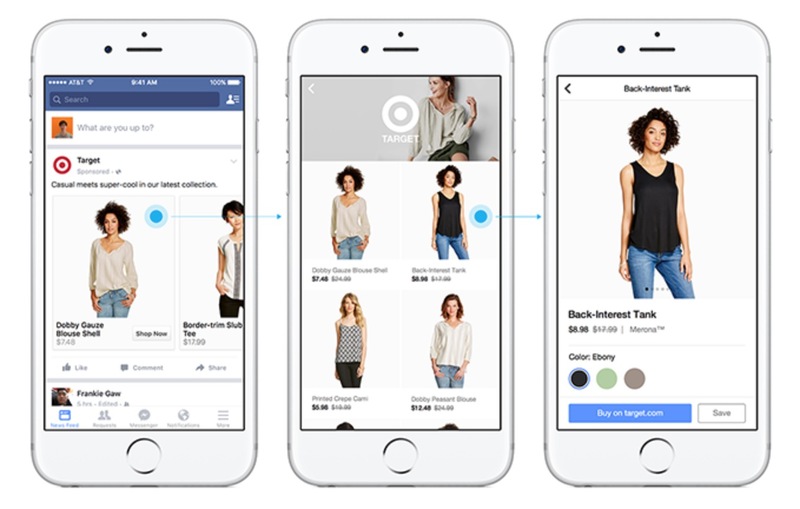 From the It Was Only A Matter of Time Department: Facebook is testing a shopping section that it says will act as a “single place for people to more easily discover, share, and purchase products.” And also never, ever use any other site besides Facebook. The Hollywood Reporter asks an important question: Does the Future of Television Belong to the Device or the App? The site has a story this week about a new case before the Federal Communications Commission that’s dividing the movie and TV industry and bringing tech companies like Amazon and Google into the fray. Speaking of control issues, Twitter suspended the accounts for the sports blogs Deadspin and SB Nation over the weekend for posting copyrighted GIFs and video highlights. Deadspin at least had a little fun at the NFL commissioner’s expense when the account was reactivated. Now, Windows 10 officially came out this summer, but the work is not finished. Microsoft has promised it to make Windows 10 an ever-evolving system and the company just released its Windows 10 Insider Preview Build 10565 version this week. Apple updated its iMac line of desktop computers, bringing faster processors and 4K or 5K displays to the hardware. New input accessories the Magic Keyboard 2, the Magic Mouse 2 and the Magic Trackpad 2 — now with Force Touch — were also announced. Experian, one of the bureaus out their keeping tabs on people’s credit, got hacked last week. Brian Krebs, who runs the Krebs on Security blog, has a story about how the bureau’s security practices have lapsed over the past few years due to attrition, dissatisfaction and other factors. 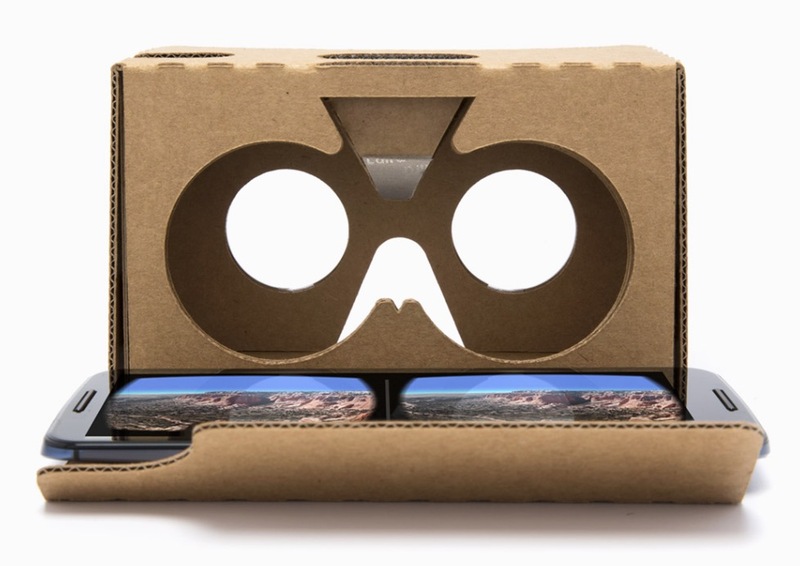 Google Cardboard is expanding internationally. The little fold-together virtual reality viewer that works with your smartphone and a special app is now is available in 39 languages and over 100 countries on both Android and iOS devices. And finally, with The Martian topping the movie box office two weeks in a row and the Red Planet getting lots of press anyway, NASA released a document detailing its next steps in it Journey to Mars project, which it has been working on for some time. It may sound farfetched, but it it took less than ten years from President Kennedy’s call to put a man on the moon to NASA’s Apollo 11 mission making it a reality. And speaking of the Apollo missions, check out the Project Apollo Archive that was recently published on Flickr. Science! 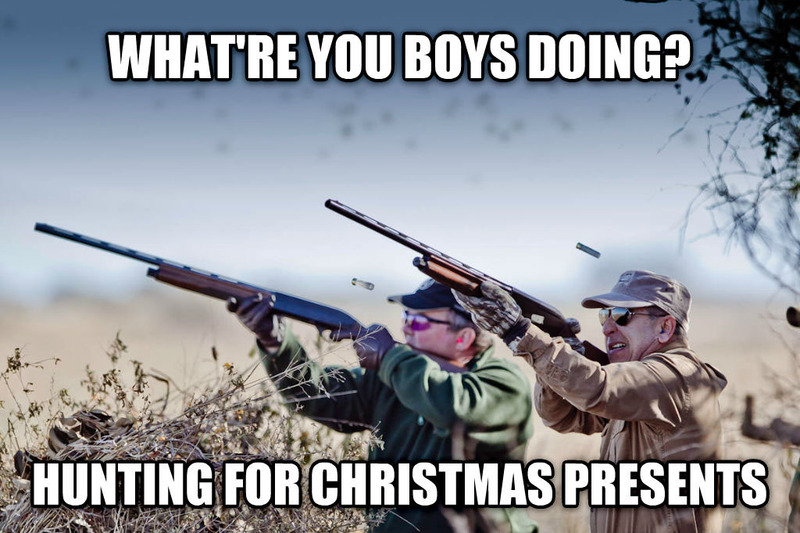 It just makes you want to . . . break into song sometimes, doesn’t it? It’s been a busy September already, but the Federal Communications Commission hasn’t forgotten about the proposed merger of Charter Communications/Time Warner Cable/Bright House. The agency has put forth the request for public comments on the possible transaction, just as it did last year with the proposed Comcast-Time Warner Cable merger that later collapsed. You have until October 13th to comment and yes, you can file your comment online, as several people have already. In other legal news, United States Court of Appeals for the Ninth Circuit in San Francisco has ruled that copyright holders must pause to consider if use of their material qualifies as fair use before issuing a takedown notice under the Digital Millennium Copyright Act. It’s all in the case of Lenz vs. Universal, also commonly known as The Dancing Baby Lawsuit, and it started way back in 2007. Although a triumphant Monday press release touting first-weekend sales did not arrive, Apple did release a statement announcing that global pre-orders for the new iPhone 6s and 6s Plus models were on track to beat last year’s 10 million first-weekend sales of the iPhone 6. The iPhone 6s Plus does seem to be sold out in numerous areas, but a manufacturing issue has been rumored in the shortage blame game. And if you’re thinking about buying one of the new iPhone models, The Washington Post has a guide to the various payment plans you can choose from now if you have to have the latest model. This week saw yet another Republican debate on television as next year’s Presidential campaign continues to grind on. 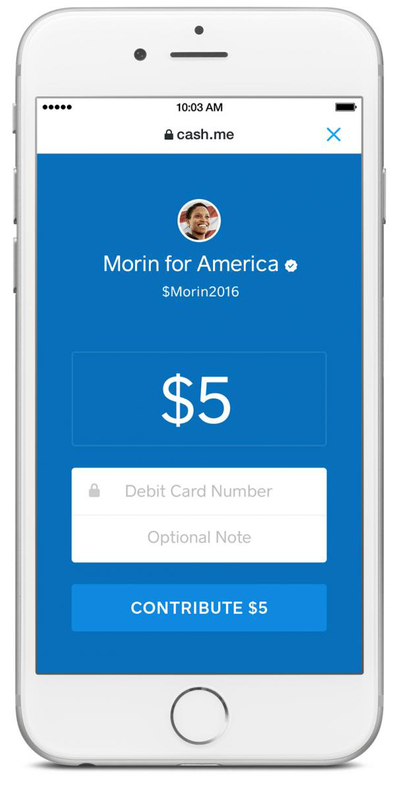 In the spirit of things, Twitter announced that it was teaming up with Square to let people in the United States donate to the political candidate of their choice with a tweet. Facebook bought the Oculus Rift virtual reality company last year and many wondered why, but The Wall Street Journal is reporting that The Social Network is developing a stand-alone video app that would support “spherical” or 360-degree clips. Facebook is not commenting on that topic yet, but CEO Mark Zuckerberg did say this week that the company was developing a Dislike button for posts. Flickr is also getting into virtual reality and did a little VR demo at a festival in Oregon last weekend. After putting on a the VR goggles, a user would be immersed in a 360-degree panoramic photo. Oh, and Sony announced its Project Morpheus product is now PlayStation VR. Also in the world of “virtual” but not “reality”. . . Annalee Newitz over at the Gizmodo site continues her investigation into the Ashley Madison site and how the company alleged used female-identifying chatbots or “fembots” to lure unsuspecting male customers into paying for credits in order to keep interacting with what they thought were real women. 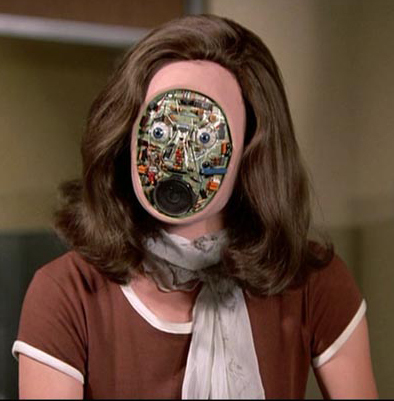 Although they used more sophisticated language, the Ashley Madison fembots were not all that far removed from ELIZA and some of the early chatbots from the 1970s. NASA is preparing to send Microsoft’s HoloLens hardware up to the astronauts in the International Space Station, with delivery scheduled for a cargo mission in early December. And for those with Ultra High Definition 4K TV sets and not much to watch on them, NASA just announced it’s partnering with Harmonic to create a new channel called NASA TV UHD. 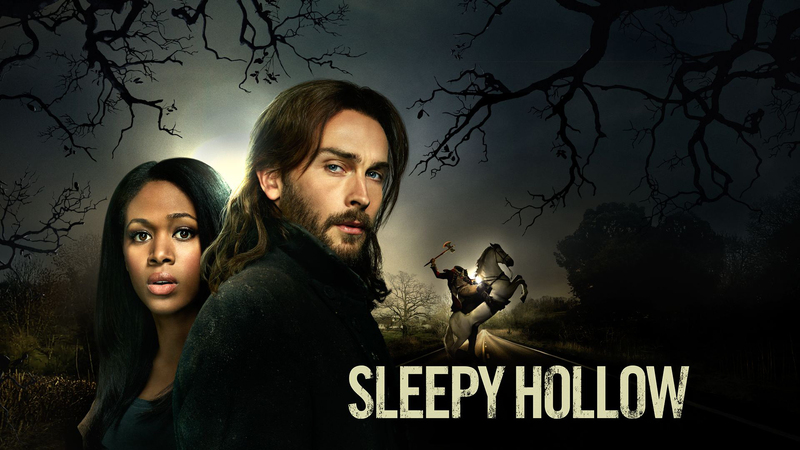 NASA says this will be the first ever non-commercial consumer ultra-high definition (UHD) channel in North America and said it plans to start broadcasting on it November 1st. The White House was not the only place that got a note of concern this week. 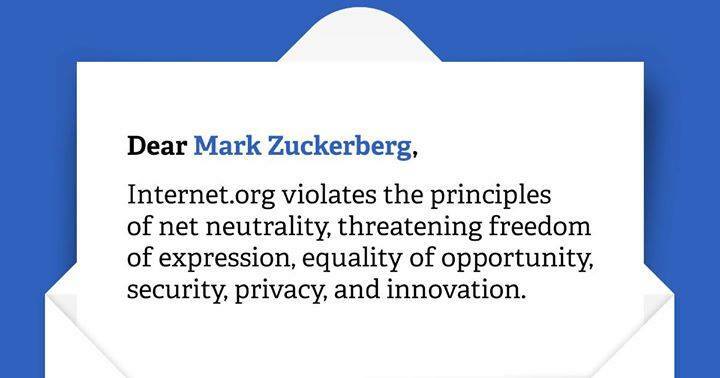 Mark Zuckerberg, CEO of Facebook, received a group letter of opposition signed by 67 digital rights groups who don’t like the idea of the company’s Internet.org project because it stifles the concept of net neutrality, freedom of expression and all that stuff. Also in letter writing news, the Federal Trade Commission has asked the bankruptcy court handling the RadioShack case to protect the personal information of former RadioShack customers. As more companies eventually go bust and their data assets are up for grabs, the FTC will likely be writing a lot more letters. Worried that the telcos will backslide on those new Net Neutrality rules from the Federal Communications Commission? 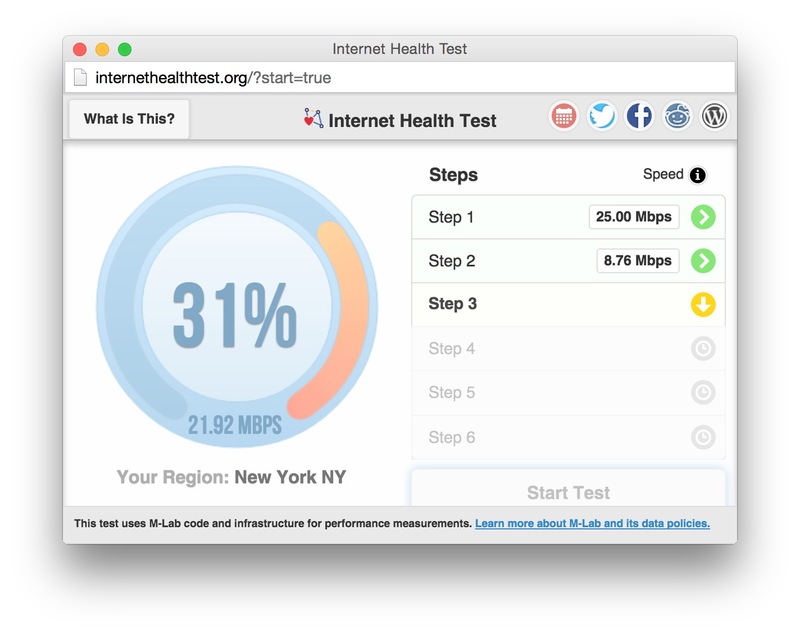 Internet activists have launched an Internet Health Test site that checks the quality of your broadband connection and looks for any sign of speed degradation, perhaps by an ISP throttling. Your results are then shared as compiled data in the public domain. Meanwhile, AT&T CEO Randall Stephenson, who once threatened to pause developments of fiber networks if the FCC’s new rules were passed, said AT&T would keep investing in its infrastructure because he is now confident the new rules will be overturned. Federal investigators are looking into the claims of one Chris Roberts, a security researcher who said he was able to hack into the computer systems on an United Airlines flight. He said he could gain enough control to do things like drop the oxygen masks, mess with the cockpit’s alert system or even cause the plane to move sideways. Um, yeah, Federal officials, please look into this. According to an investigative piece out this week from Advertising Age, Google has a crack squad of Antifraud Specialists fighting the ad-bot hucksters. And speaking of exploits, there’s a new one out that shows a proof-of-concept address-spoofing attack using a bug in Apple’s Safari web browser. In other Apple News, the fancy new 15-inch MacBook Pro with the ForceTouch trackpad is available now, as is a cheaper version of the 27-inch iMac with 5K Retina display. Prices start at about $2,000 for either. If the Internet can be believed, Apple is getting ready to roll out some fresh code for both the Apple Watch and the Apple TV; the new version of that set-top box is expected next month at the World Wide Developers Conference. Oh, and The Wall Street Journal has a story this week that explains why Apple hasn’t jumped into the full-on television market yet. The Internet has come to the rescue again! 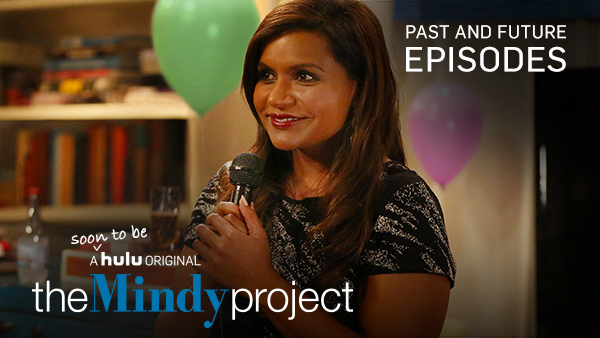 After it was canceled by Fox, Mindy Kaling’s sitcom, The Mindy Project, was picked up by TV-streaming service Hulu for a fourth season of 26 new episodes. And finally, Microsoft is celebrating 25 years of Solitaire on Windows. Woo hoo! Microsoft’s solitaire collection, which includes the standard Klondike version, plus the FreeCell, Spider, TriPeaks, and Pyramid variations, is available free in the online app store for Windows Phone and Windows 8.1. Here’s to a quarter century of lost productivity in offices across the globe! March marches on! Facebook’s F8 Developer Conference kicks off this week and early word has it that the Social Network could become a host for the content written by major media outlets. The company in talks with big news organizations as it tests new formats for the project, in which advertising revenue (as always) could be the big lure for all parties involved. 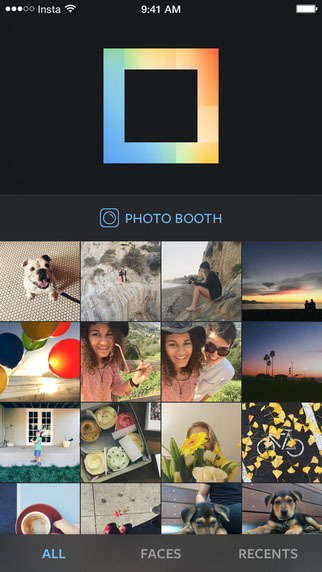 Facebook’s Instagram service has a new app called Layout that lets smartphone photographers remix up to nine images from their camera rolls into customizable collages. Layout (shown here) is free and now available for iOS users, with an Android edition, as usual, currently in the works. Oh, and the Toronto Globe and Mail is among those who noticed that Facebook seems to be making corporate and brand pages less of a place for angry customers to post angry rants about lousy customer service and product complaints. A recent tweak by Facebook collapses user comments so they are not as easily visible — and readable — on corporate pages. Samsung seems to be grabbing the reins on the bloatware. People posting in the XDA Developers Forum online are chattering that many pre-installed apps for the new Galaxy S6 and S6 Edge phones can be easily removed without hassle. Removable apps are said to include Samsung’s S Voice and S Health apps, Google’s troika of Gmail, YouTube and Google+ and Microsoft’s OneNote, OneDrive and Skype. Microsoft and Samsung aren’t parting wys across the board, though, as the two companies announced earlier this week that Samsung will pre-install Microsoft Word, Excel, PowerPoint, Skype and a few other company apps on certain Samsung Android tablets this fall. On the wearables beat, the Kickstarter campaign for the competing Pebble Time smartwatch saw a healthy spike around and during Apple’s media event a few weeks ago and is close to 20 million dollars, making the crowdfunded, less expensive smartwatch a player in the game. And Google Glass, despite having its original model discontinued, is not dead yet. Just a week after we mocked it here for hardware stagnation, there are early leaks to BuzzFeed News about the Apple TV set-top box getting an upgrade and makeover, maybe right in time for the World Wide Developers Conference in June. According to sources, the revamped box would include a beefier processor, voice control with a Siri-esque digital assistant and have its own App Store to load up your home screen. As Wired noted, this alleged new hardware would go real good with the also-rumored live-streaming TV channel bundle. The biography of Steve Jobs written by journalist Walter Isaacson in 2011 went on to sell millions of copies, but many people close to Mr. Jobs felt the book focused a little too much on his periodic-but-infamous bad behavior. Now Becoming Steve Jobs has arrived in stores this week. 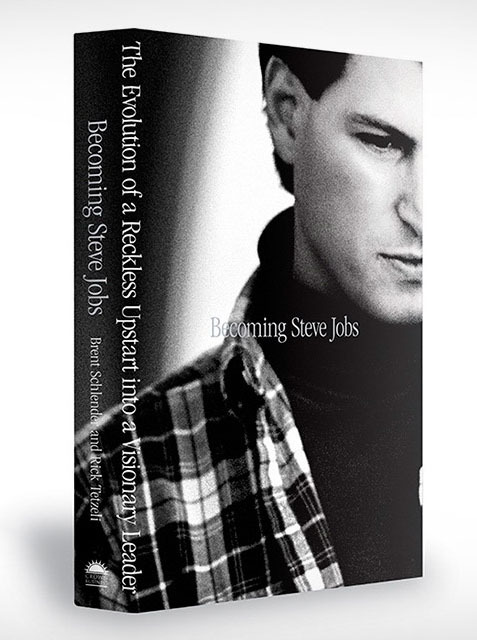 Although Mr. Issacson’s volume was authorized by its subject and used official interviews with Jobs as part of its source material, Becoming Steve Jobs is already earning high praise for its accuracy by those who worked with him and knew him best. Two lawsuits have been filed against the Federal Communications Commission’s new rules for net neutrality. Yes, these are probably the first of many. Amazon has gotten approval from the Federal Aviation Administration to test out commercial drones. The super-uber-mega-everything store has been issued an “experimental airworthiness certificate” from the FAA that allows Amazon to conduct the research it says it needs to train crew and further develop its Prime Air package delivery system. Amazon’s ambitions do have some skeptics, the Network World site for example, which points out that the problem with drone deliveries is practical, not regulatory. Amazon thought the whole FAA-approval process was way too slow. And finally, if you love spectacular photos of rockets, space and other celestial subjects, NASA’s official website and dozens of social media feeds have traditionally been great places to go for new and interesting material, but now even the private space contractors are sharing their snaps. SpaceX, which makes cargo capsules, rockets and other spacecraft, has now put a number of breath-taking images on its Flickr page. The SpaceX pictures also sport a Creative Commons license that allows noncommercial re-use without a license with attribution, so hey, that photo at the top of this post is totally courtesy of SpaceX. So if you need a handsome photo for your blog or lesson plans, check it out. And don’t forget to grab a few inspiring pix for your desktop wallpaper, too. 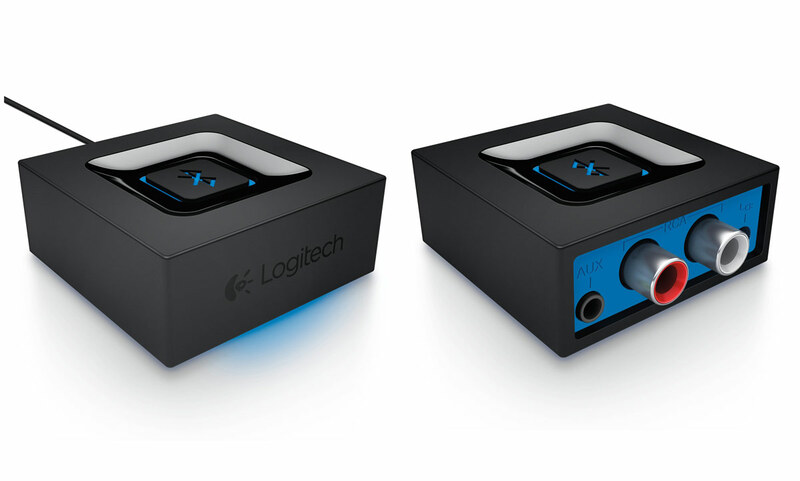 El Kaiser reviews Logitech’s $40 Bluetooth Audio Adapter. The device allows you to play audio from smartphone or tablet through your home stereo or powered speakers. Of course he (not so) secretly pines for the $250 rBlink wireless DAC from Arcam which promises superior sound quality and rock solid Bluetooth pairing to mobile devices. 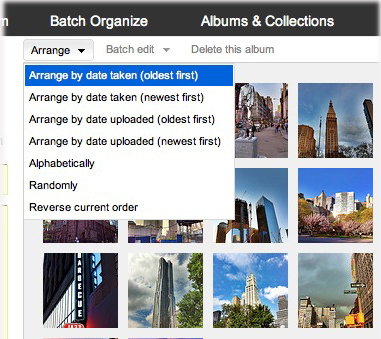 If you use Flicker and are looking to reorder your snapshots J.D. shares a Hopefully Helpful Hint that will show you how. Lots of Google news this week as the Big G kicked off its annual I/O developers conference in San Francisco by announcing a new version of Android. Google takes another swing at the living room with Android TV and releases a new software update to the Chromecast streaming dongle. Their recent acquisition Nest, maker of Internet-connected smart-home thermostats and fire alarms, has opened its platform to outside developers and buys security firm Dropcam. The search and advertising behemoth experiments with its own domain registration service. In other news, Yahoo releases a replacement app launcher for Android. Dating sites get hit on hard by phishing scam; Cloud storage prices drop; both houses of Congress hold hearings about proposed merger between AT&T and DirecTV; the Supreme Court rules against Aereo, a service that allows subscribers to view live and time-shifted streams of over-the-air television on Internet-connected devices, in th the Internet company’s battle with broadcast networks; and finally Google, the Girl Scouts, the MIT Media Lab, TechCrunch, the National Center for Women & Technology and others launch the “Made with Code” website. 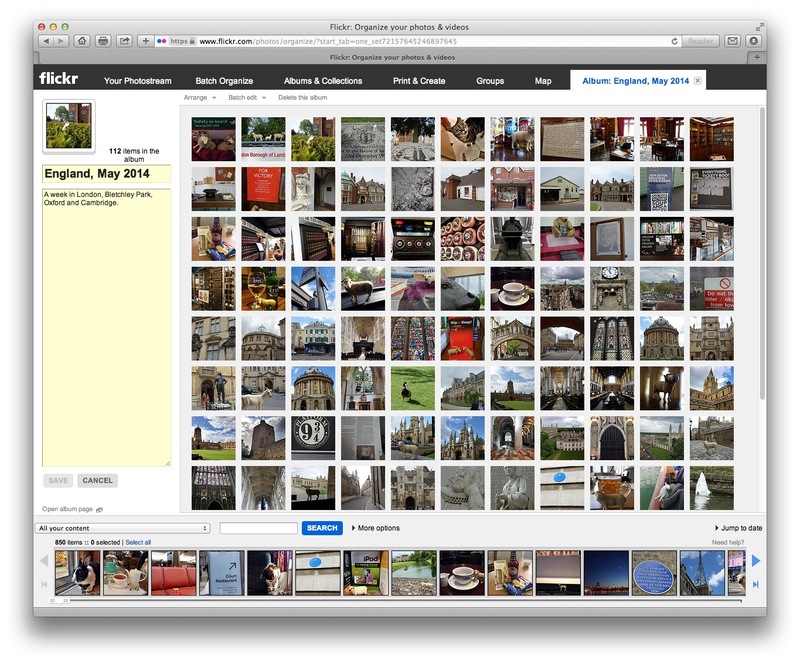 Log into your Flickr account on the Web, click on Albums and open the album you want to fix. In the row of buttons at the top of the window, click Edit (shown above). This whips you onto Flickr’s Organizer screen (shown below), which displays all the pictures in the album as little thumbnail images. At the top of the Organizer window, click the menu triangle next to Arrange (shown below). Here, you can choose from a few automatic options, like ordering the pictures in chronological or reverse chronological order. But what if the date in the actual photo file is wrong ? It’s time to change time. Double-click on the photo you want to adjust. In the box that pops up, click Dates. Enter the new date and time in the “Date taken” field. If you want to go through the album photo by photo, click the “Next item” button in the bottom-right corner to advance. You can also turn on the checkbox next to “Go to next item when you save?” to bounce ahead automatically. 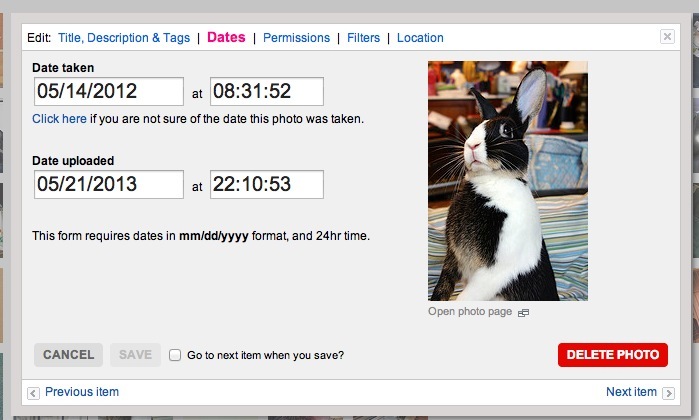 And if you want to put the photos in a specific order, you can change the times to a chronological sequence here and then select the appropriate the “Arrange by date” option in the menu. 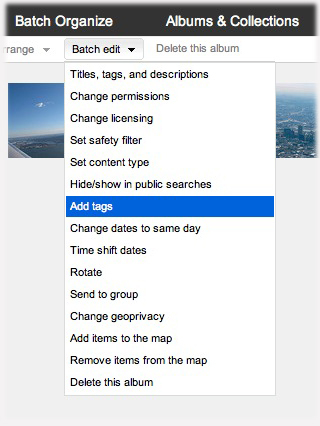 While you’ve got it open, the Organizer window is also useful for batch work, like geotagging a bunch of pictures at once by dragging them into a map, adding tags, or automatically time-shifting groups of dates. Once you get these pesky tasks out of the way, you can go out and shoot more photos to eventually organize. We’re refreshed, rested and ready for more shenanigans in 2014! J.D. gives us some helpful hints for what to do with all those holiday snapshots cluttering up your smartphone. We may be a week into the new year but that doesn’t stop El Kaiser from revealing what he considers the top Tech Term of 2013. Lots of news from Las Vegas as the annual international Consumer Electronics Show opened this week. Samsung announces a new line of PRO models of its popular Galaxy Tab tablets; Panasonic announces a 7-inch addition to its Toughpad family of ruggedized tablets; Google partners with several automobile manufacturers to provide infotainment systems for their new car models; Intel has a new mini-computer called Edison; plus Bluetooth toothbrushes smart TVs and appliances and some fun wearable tech from ThinkGeek.com. Have you ever looked at your phone’s usage settings and realized you don’t have that much room left on it? Unless you’ve got expansion-card options, you’re probably going to want to dump unused apps and other old files to free up space. So what takes up a lot of space on many smartphones today? Photos and videos — especially on newer models with better cameras that take higher-resolution photos and HD video. Now, some people like to keep a lot of pictures on their phones – it’s the digital equivalent of the plastic wallet sleeve full of kid, family and vacation photos. Still, there are others who don’t need to have a ton of pictures on hand at all times and some people are just too lazy to clear things off, especially if they don’t want to go through deleting images one-by-one to keep the really good stuff. Need a quick way to deal with gigabytes of photos? Just copy them all to your computer and then whack them from the phone. Once they’re imported to the desktop or laptop, you can lean back and look at a bigger screen as you weed through the images you want to keep and delete the duds. You can keep an archive of the saved photos on the computer, as well as that computer’s backup disc or drive. Just plug the phone into the computer with the cable it came with and let the computer offer to import them all at once. Most operating systems recognize a smartphone as a camera and then treat it like any other camera with a variation of the same question — “Hey, do you want me to import all these photos and them delete them for you?” Windows does this (even Windows 8), as do photo programs that run on Windows like Picasa and Adobe Photoshop Elements. Mac versions of those programs, as well as iPhoto, Image Capture or Aperture do the same thing. Once you copy all the photos off the phone, you can delete them from the handset and have gigabytes more space to fill up with new photos. From the computer, it’s also pretty easy to upload all your favorites to Flickr or another photo-sharing site — where you can still get to them from your phone, without having to give up local storage space. If you simply want to keep the photos on the phone but do want keep them backed up, you’ve got plenty of online backup options. For example, Google+ has an auto-backup feature for photos and Apple has iCloud Photo Stream for people with iOS devices. 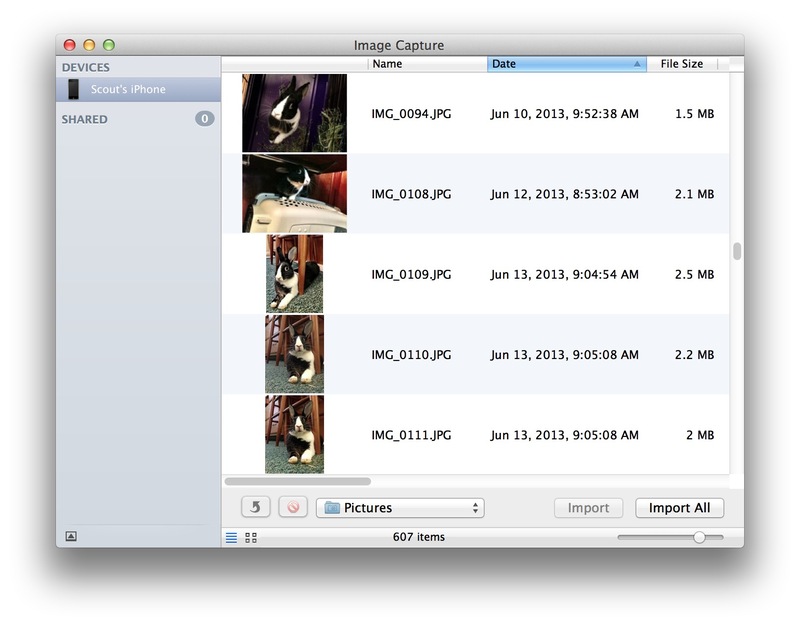 Dropbox has a Camera Upload feature and you can also fine photographer-friendly backup apps like MyShoebox out there. So remember, if you want to free up space on your phone, check to see how many pictures you’re got squirreled away on there. If your mobile photos number in the hundreds, consider moving them off the phone and to the safety of the computer or online archive. And even if you have plenty of room on your phone, back up your photos anyway. A picture is worth a thousand words, but if you lose your phone and the only copies of your favorite mobile snaps, your own vocabulary may suddenly be reduced to a couple of really bad words. Pedro reviews new on-ear headphones from two companies that are doing their best to keep things friendly between them and this big, blue marble we call earth: House of Marley’s EM-JH073 “Liberate” and ThinkSound’s On1 Studio Monitors. J.D. has a (Hopefully) Helpful Hint™ for those of you dreading the photographic evidence of your antics guaranteed to flood your social networks this holiday season. In the news, Sony sells more than 1 million PlayStation 4s with Microsoft’s XBox One on-deck; Samsung claims Gear smartwatch sales are brisk; Google and Bing get set to take on pedophiles; Facebook confirms that anything you post on their service is fodder for advertising; Sprint and Best Buy offer students a deal on phones; and the world awaits the 50th Anniversary episode of Doctor Who.